BRENT crude oil complete the trading week near the region of $ 67.27 per barrel. And it continues to move within an upward correction. Moving averages indicate a downward trend. At the moment, we should expect an attempt to grow and test the resistance area near the level of 68.95. Then continued the fall of oil in the area below the level of 51.05 dollars per barrel. An additional signal in favor of lowering oil prices this week will be the formation of the «Head and Shoulders» reversal pattern on the relative strength index (RSI). The second signal will be a rebound from the upper boundary of the bearish channel. The abolition of the option of falling prices and BRENT oil prices in the trading week of April 1 — 5, 2019 will be a strong growth and a breakdown of the level of 73.50. This will indicate a breakdown of the upper boundary of the channel and the continued growth of oil in the region above the level of 77.00. With the breakdown of the area of ​​support and the closure of quotes below the level of 63.50, we should expect confirmation of a decline in the price of oil BRENT. BRENT oil Forecast and Analysis April 1 — 5, 2019 implies an attempt to test the resistance area near the level of 68.95. Where should we expect a rebound and an attempt to drop oil with a potential goal at the level of 51.05. 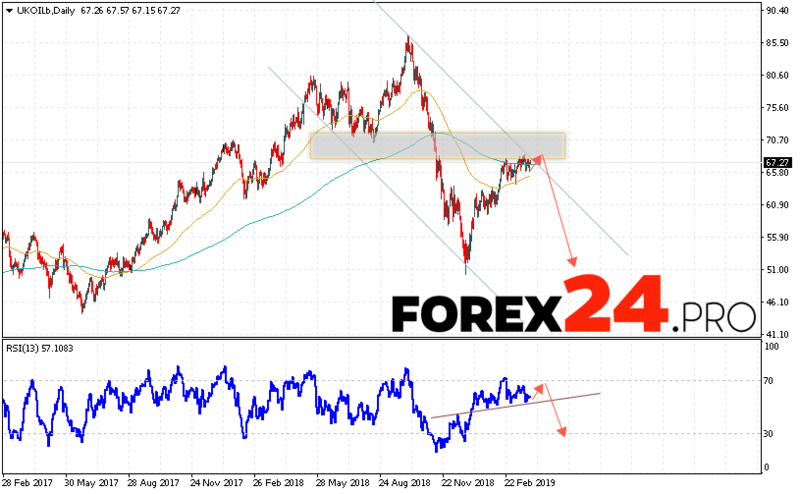 An additional signal in favor of reducing the price of oil will be a test of the trend line on the indicator of relative strength index (RSI). Cancellation of the fall option will be strong growth and the breakdown of the 73.50 area. This will indicate a breakdown of the resistance level and a continuation of the oil price rise.